Efficiency. A flash lamp powers a Nd:YAG laser. It provides something comparable to the flash from a camera, but much larger, so it offers a standard white light flash with a wavelength in the range of ultraviolet (UV) to infrared (IR). To pump the Nd:YAG crystals requires a wavelength of around 808 nanometers (nm). All other light produced by the flash lamp is absorbed as wasted radiation from other parts of the cavity and must be removed as heat by the water chiller chamber. Because of this limited available light spectrum and the need for the chiller, the average Nd:YAG laser has an energy efficiency level of 3 to 4 percent. In contrast, today’s FSS lasers can reach efficiency levels of up to 35 percent. A FSS laser achieves this using laser diodes as its power source. These diodes produce only one specific wavelength that fits the absorption line perfectly. By harnessing the energy correctly, all the light that is produced by the diode is absorbed by the fiber and transferred to the laser light. This means that a 300-watt Nd:YAG system can have a 10-kilowatt power consumption, whereas a 300-watt FSS laser system only uses about 1,000 watts to complete the same job. This is important for shops because now even 450-watt FSS systems can be powered and operated by a standard 220-volt outlet. Cooling. 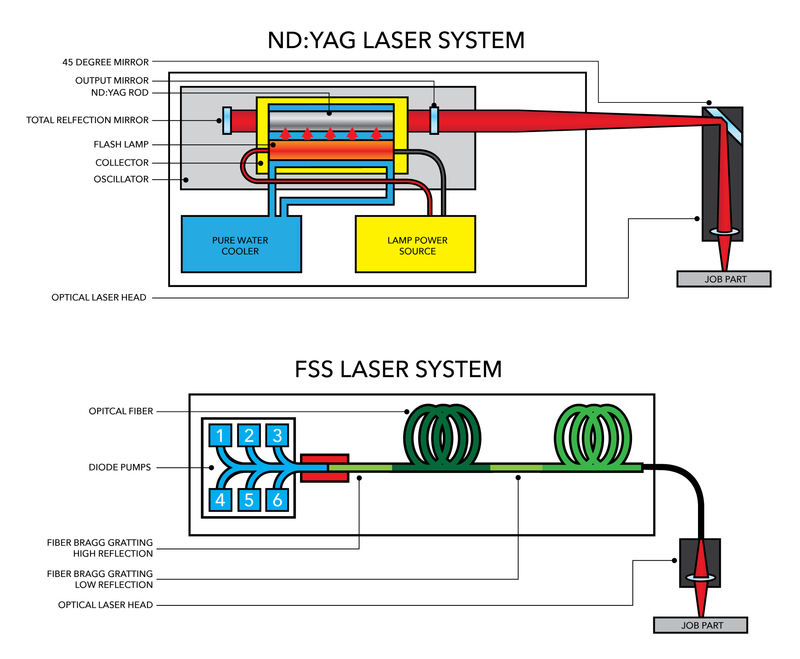 A Nd:YAG system uses laser crystals, electricity and a xenon flash lamp to create the beam. This process generates a large amount of heat within the machine, which requires a large external cooling unit to maintain proper machine temperature and performance. The chiller takes in the heat and releases it away from the machine and into the surrounding area, which can increase the temperature of the shop if done over sustained periods of time. The chiller also consumes significant amounts of electricity to keep the water temperature stable. Because diodes power FSS lasers in a specific wavelength that can be directly translated into laser light, they produce less extraneous heat. For example, to create 300 watts of laser power from a FSS machine requires 1 kilowatt of electricity, producing 700 watts of ambient heat that a small fan can remove. Creating the same wattage of laser power from a Nd:YAG machine requires 10 times the amount of electricity, resulting in 9700 watts of residual heat that can only be cooled with an external chiller. Mobility. The high power consumption and use of water chillers make Nd:YAG laser welders of more than 150 watts difficult to move, and so too does the precision alignment of the Nd:YAG laser crystal and two resonator mirrors. Even with superior mechanics, the vibration and potential shock from transport can misalign the resonator and then require service by a laser technician. The low power consumption of FSS laser systems enable a standard 220-volt outlet power source, air cooling by small fans and a solid resonator with no mechanical adjustment. All of this makes them more mobile. Because the laser source is completely integrated into the main body, the laser head is very small and machinists can easily move and adjust them to any position that they need for welding, even in difficult-to-reach places on a very large mold or in a molding press. Maintenance and dependability. Nd:YAG systems require adjustable mirrors, traditional laser crystals and a flash lamp that work together to produce the laser beam. This process generates large amounts of heat within the machine that need to be cooled with water chillers, requiring additional moving parts and power consumption. The FSS laser beam source is completely sealed. It does not have mechanical parts that a machinist can adjust. It receives the pump power directly from the laser diodes, which enables approximately 100,000 hours of continuous operation. This means that if the machine were in use and running 24/7, these diodes would only need to be changed once every 10 years (much like the diodes found in the telecommunications industry). In contrast, Nd:YAG lasers receive power from flash lamps with laser crystals that transport energy to the active medium. A typical welding shop could expect to go through a Nd:YAG lamp every couple of months, and a toolroom may get a year out of a lamp. The mirrors inside the Nd:YAG systems need to be periodically adjusted and replaced, and the expensive laser crystals will not last forever. In order to ensure the unit is running at maximum potential, schedule a yearly PM program with your laser machine supplier. 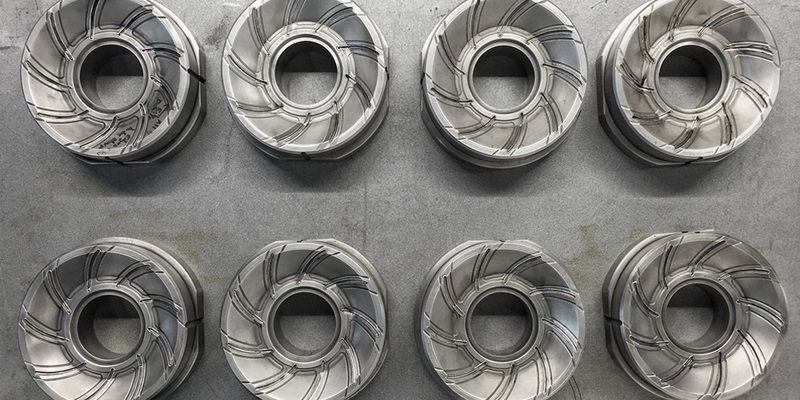 This article was featured in the September 2017 MoldMaking Technology Magazine. Click here to download the full version of the magazine.